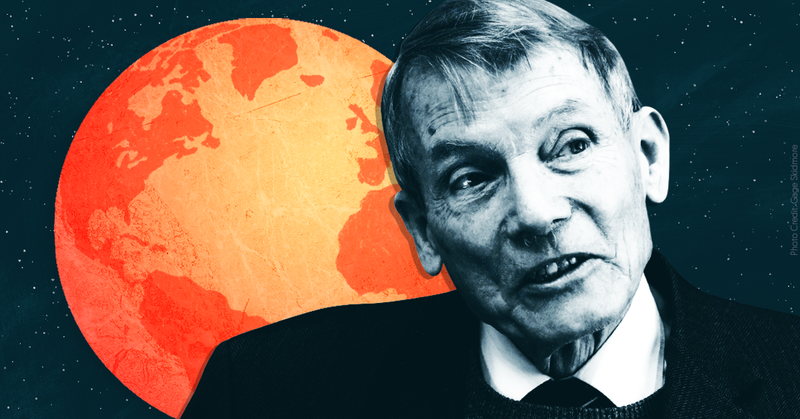 President Donald Trump may put climate-denying physicist William Happer at the head of a new Presidential Committee on Climate Security, according to a recent Washington Post article. The proposed panel would evaluate whether climate change poses a national security threat. (It does.) Happer, an emeritus professor at Princeton University and veteran of the George H.W. Bush administration, currently serves as Trump's deputy assistant for emerging technologies on the National Security Council. It’s not hard to understand why Trump would pick Happer to head his panel: He's a credentialed scientist who denies that carbon dioxide emissions are causing extensive global warming and has testified before Congress about the need for a government-mandated panel to review climate science, which he said is “far from 'settled. '” Though he's a physicist, Happer has never published any peer-reviewed research on climate change. Happer has multiple connections to the Koch brothers and fossil fuel companies. He served as adjunct scholar at the Cato Institute, which was founded by Charles Koch, and has been affiliated with The Heartland Institute, a climate-denial group that has received funding from the Charles G. Koch Foundation. Happer was on the board of directors at the ExxonMobil-funded George Marshall Institute, and he co-founded its successor, the CO2 Coalition. He has also disclosed that Peabody Coal paid him to testify at a hearing of the Minnesota Public Utilities Commission. A 2015 Greenpeace investigation exposed Happer’s willingness to work even more directly for fossil fuel companies. Corresponding over email with a Greenpeace staffer who was posing as an oil company consultant, Happer agreed to write about the alleged benefits of increased carbon emissions at the behest of a fictional Middle Eastern oil company and to not disclose the company's payment to his group, the CO2 Coalition. But Happer is no ordinary climate-denying, pay-for-play academic. His outrageous, false claims about climate science often include bizarre and inflammatory analogies. Here are a few of his most egregious comments. This is George Orwell. This is the "Germans are the master race. The Jews are the scum of the earth." It’s that kind of propaganda. The demonization of carbon dioxide is just like the demonization of the poor Jews under Hitler. Carbon dioxide is actually a benefit to the world, and so were the Jews. Demonization of CO2 and people like me who come to its defense is nothing to be proud of. It really differs little from the Nazi persecution of the Jews, the Soviet extermination of class enemies or ISIL slaughter of infidels. It’s another one of these sort of mass hysterias that have gripped humanity since it began. In our country, in America, we had a sort of similar case of mass hysteria with Prohibition. There were a few cautious people who said, “Maybe, you know, Prohibition isn’t a good idea. You might increase organized crime, for example." Everything they said was right, and yet, you know, when the amendment for Prohibition was put to the vote, every state except one, Rhode Island, voted for Prohibition and not one of them intended to honor it. It was just what everybody else did. “How could you be in favor of demon rum?” You know, demon CO2. So these things happen. More sinister are these movements in Europe: the fascists, the communists. They were mass hysteria too. Any movement can be captured by thugs, and that’s what’s happened. At the Salem witch trials, every one of those judges had a Harvard degree. Scientific consensus is often wrong. Happer accused people of hyping climate change to "make a buck"
I think it began to get legs in the '70s and '80s. There was an Academy of Science report in the '70s by [Jule] Charney, and then it got latched on by green politicians, Al Gore comes to mind, but there are many others. So people saw a way to make a buck in demonizing CO2, and that’s what’s happened. CO2 is not a pollutant. Life on earth flourished for hundreds of millions of years at much higher CO2 levels than we see today. Increasing CO2 levels will be a net benefit because cultivated plants grow better and are more resistant to drought at higher CO2 levels, and because warming and other supposedly harmful effects of CO2 have been greatly exaggerated. Absolutely. Not only a non-problem. I see the CO2 as good, you know. Let me be clear. I don’t think it’s a problem at all, I think it’s a good thing. In a 2018 video for Prager University, a right-wing propaganda outlet, Happer attacked climate science models as unpredictable while minimizing the role CO2 plays in global warming. Despite what Happer says, the science is clear: Human-caused CO2 emissions are the primary driver of climate change, climate change is already having negative effects in the U.S. and around the world, and its catastrophic impacts will intensify in coming years. This has been confirmed by recent major reports from teams of respected scientists at the U.N. Intergovernmental Panel on Climate Change and in the U.S. government. Happer’s eccentric and incorrect views on climate science should disqualify him from serving on the National Security Council, not to mention a White House panel on climate change. 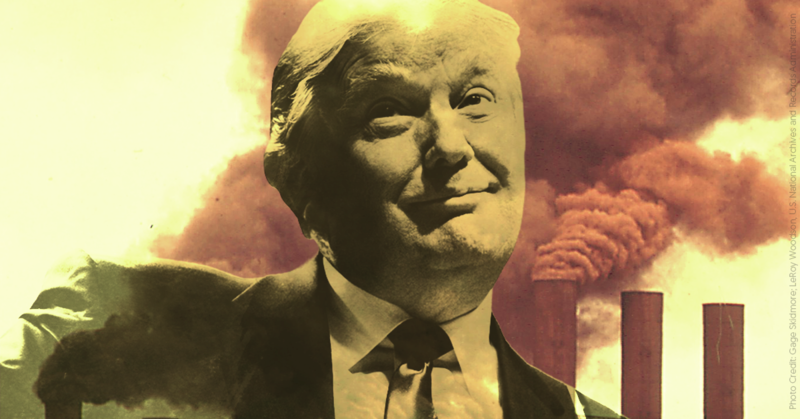 But as long as he provides Trump with cover to engage in climate denial and justify rollbacks of environmental protections, Happer will likely continue to have a loud voice in the Trump administration -- no matter how many ludicrous statements he utters. On Thursday, the Trump administration is expected to announce a regulatory rollback that will make it easier to build new coal-fired plants by eliminating Obama-era rules requiring such plants to include carbon-capture technology. Andrew Wheeler, acting administrator of the Environmental Protection Agency (EPA), is scheduled to make the announcement alongside Harry Alford, president of the National Black Chamber of Commerce (NBCC), a minority business front group that has received funding from fossil fuel interests and other corporate sources, including ExxonMobil and Koch Industries. Alford and the organization he runs have long teamed up with conservatives and business interests to fight regulations that would protect and clean up the environment. A 2017 Bloomberg investigation described the NBCC as “a shoestring operation, run by a husband-and-wife team." But despite its small size, the group provides outsized value to corporations and industry groups. The NBCC has been criticized by a number of prominent environmental justice leaders and organizations, including Green For All, GreenLatinos, and WE ACT for Environmental Justice. Here's a quick overview of NBCC activity on behalf of polluters. The Clean Power Plan, put in place by the Obama administration in 2015, aimed to curb carbon emissions from existing power plants, part of a larger effort to fight climate change. According to Obama's EPA, it also would have improved public health by cutting air pollution. Civil rights leaders, environmental justice groups, and environmental activists successfully pushed the agency to make sure the rule addressed many of the environmental and economic concerns of minority and low-income communities. But the NBCC opposed the Clean Power Plan while claiming to be speaking on behalf of African-Americans. The group commissioned and promoted a flawed study that falsely claimed the plan would disproportionately harm minorities. The study was swiftly debunked. And yet Alford became a central figure in a disinformation campaign backed by fossil-fuel interests. He placed anti-Clean Power Plan op-eds in at least seven newspapers and saw right-wing outlets echo and amplify his discredited assertions. NBCC's debunked study found new life in the Trump administration. When the EPA, under Wheeler's leadership, proposed to replace the Clean Power Plan with a weaker substitute, the White House cited the NBCC study in its talking points. In 2016, the NBCC was part of Consumers for Smart Solar, a utility-backed and Koch-backed astroturf group that campaigned on behalf of a deceptive ballot initiative in Florida. The initiative was designed to appear pro-solar, but it actually would have slowed the growth of rooftop solar while protecting the utilities from competition. Voters ended up rejecting the measure. 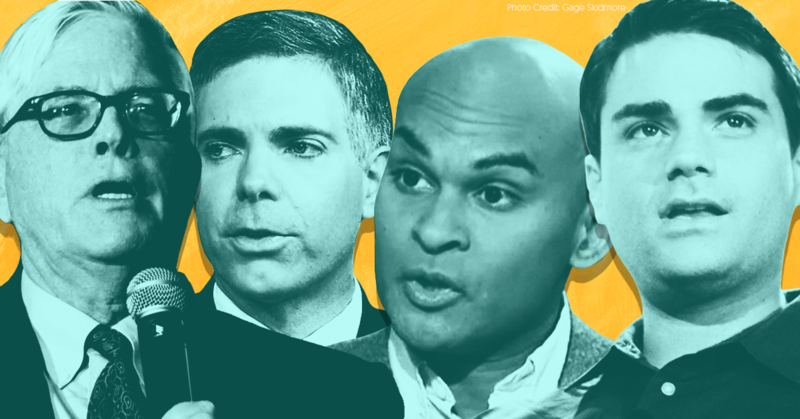 Earlier this year, NBCC joined right-wing organizations supporting an anti-carbon tax resolution proposed by Rep. Steve Scalise (R-LA), a climate denier. Alford signed a letter supporting the resolution, listing his name alongside far-right figures like Grover Norquist of Americans for Tax Reform and Myron Ebell of the Competitive Enterprise Institute. Alford: "Coal is essential to our way of living"
Alford is on the board of the Partnership for Affordable Clean Energy, also known as Energy Fairness, a self-described “coalition of working people, business owners, environmentalists, and trade organizations who are fighting for fair, responsible energy policies.” In actuality, the group and a partner organization, Working People for Fair Energy, have been closely aligned with utility companies fighting coal-ash regulation, according to a 2010 investigation by the Institute for Southern Studies. Alford and the NBCC have consistently worked against the interests of minority communities and working families to advance a pro-fossil fuel agenda. Like Wheeler did when he was a lobbyist, Alford has cashed oil, gas, and coal company checks for years. So it is fitting that they will be standing together to announce the Trump administration's latest assault on our environment and climate. In the weeks leading up to the 2018 midterm elections, The New York Times and The Washington Post filled their news pages with reporting about a caravan of migrants moving through Central America and Mexico toward the United States. The caravan was more than 1,000 miles from the U.S. border -- a journey of several weeks on foot -- and shrinking. But President Donald Trump, in a series of demagogic statements aimed at bolstering GOP chances in the elections, warned that the caravan constituted an “invasion” and a national emergency, and the Times and Post allowed him to set their news agendas. After the election, Trump largely stopped talking about the caravan, and the coverage of the subject in those papers plunged. 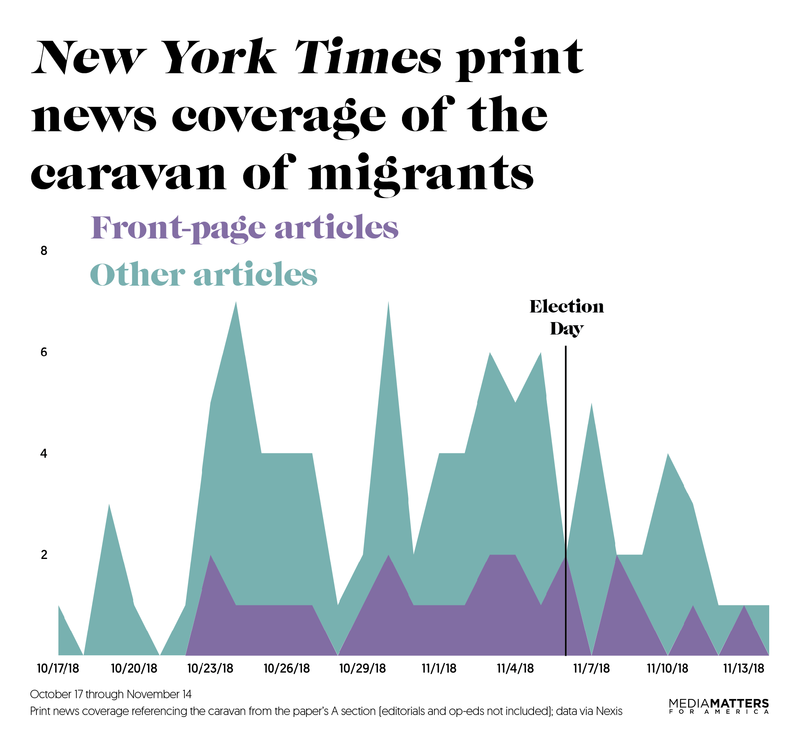 In the eight days before the election, the Times and Post ran a total of 84 news stories in their print editions mentioning the caravan, putting 25 on the front page. In the eight days since, they ran 39 such stories, only eight of which ran on A1. That’s a decline of roughly 54 percent in news stories and 68 percent in front-page news stories. I wrote about this coverage the Friday before Election Day, noting that many of the articles were laudable on their merits -- they told the migrants' stories, debunked presidential lies and conspiracy theories, and highlighted facts that undermined Trump’s demagoguery. But taken together, their sheer volume couldn’t help but to fuel his fearmongering and make it impossible for other important pre-midterm stories to break through. The papers are still producing valuable reporting on the topic -- about the migrants’ journey, the administration’s response of deploying U.S. soldiers on the border and taking executive action to limit asylum, and Trump’s own slackening interest in the caravan, among other angles. But with the elections over and in the absence of regular comments from the president, they are publishing much less of it, and they’re giving the stories they do publish less prominent placement. 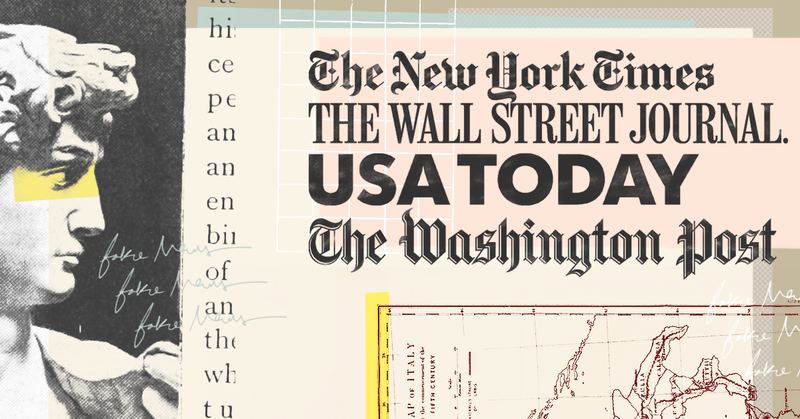 Newspaper resources, column inches, and front-page real estate are all limited -- the amount of each that a paper devotes to particular stories reveals its editors’ priorities and signals to the public which issues are important. The Times and Post appear to have given the caravan outsized coverage when Trump was fixated on it, and now that he isn’t, the papers are providing the issue with substantially less attention. 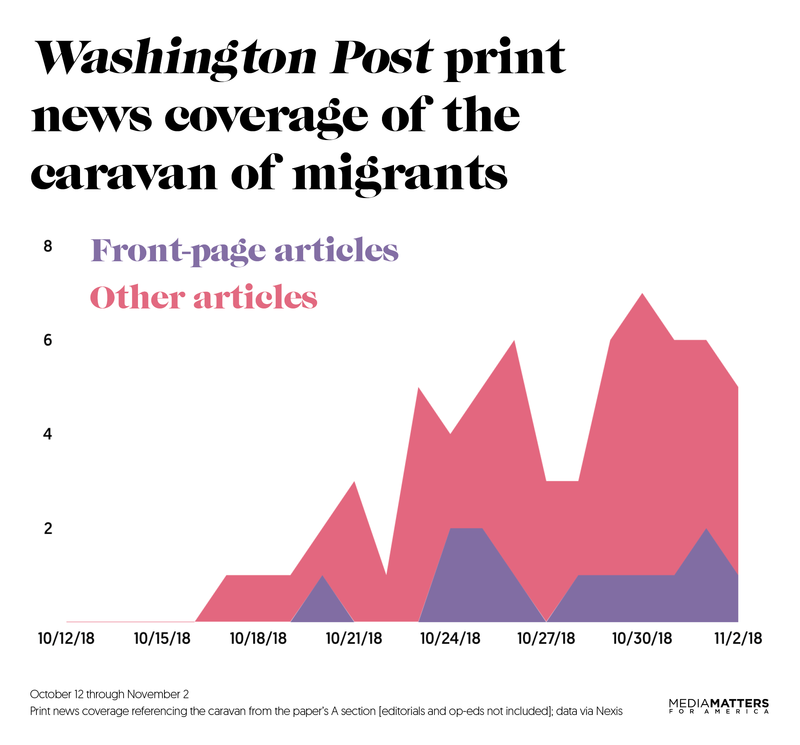 The Post has published a total of 109 articles in its print A section mentioning the caravan since it formed, putting 24 of those articles on the front page. The paper ran 48 such articles, during the eight days before the election, 13 of them on the front page; those numbers dropped to 20 and three in the eight days after the election, a decline of 58 percent and 77 percent, respectively. 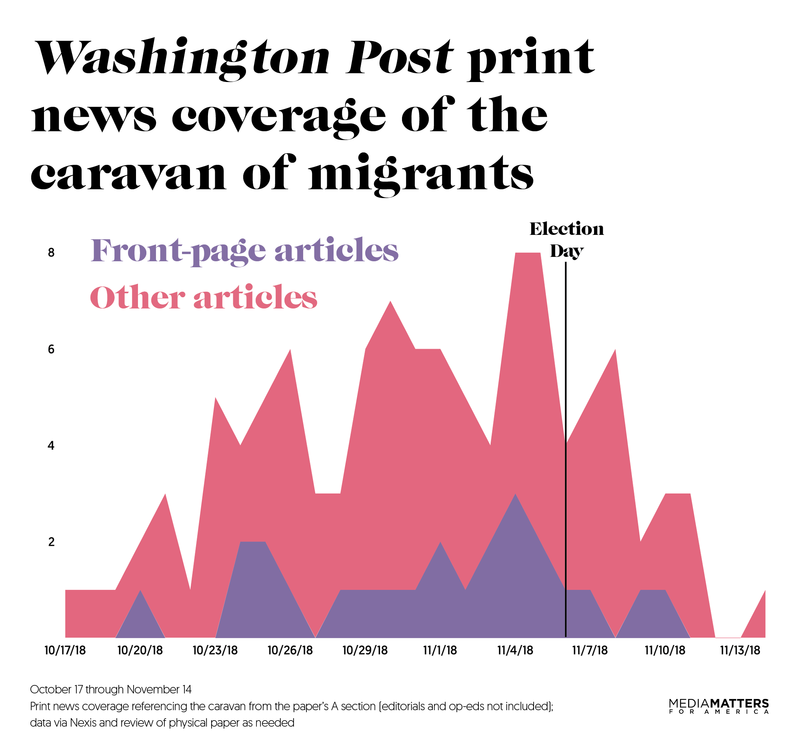 Before the election, the paper published five or more articles referencing the caravan on 10 different days. Since the election, it has done so twice. The Times has published a total of 88 articles mentioning the caravan in its print A section, putting 24 of those articles on the front page. During the eight days before the election, the paper ran 36 such articles, putting 12 on the front page; those numbers dropped to 19 and five in the eight days after the election, a decline of 47 percent and 58 percent, respectively. 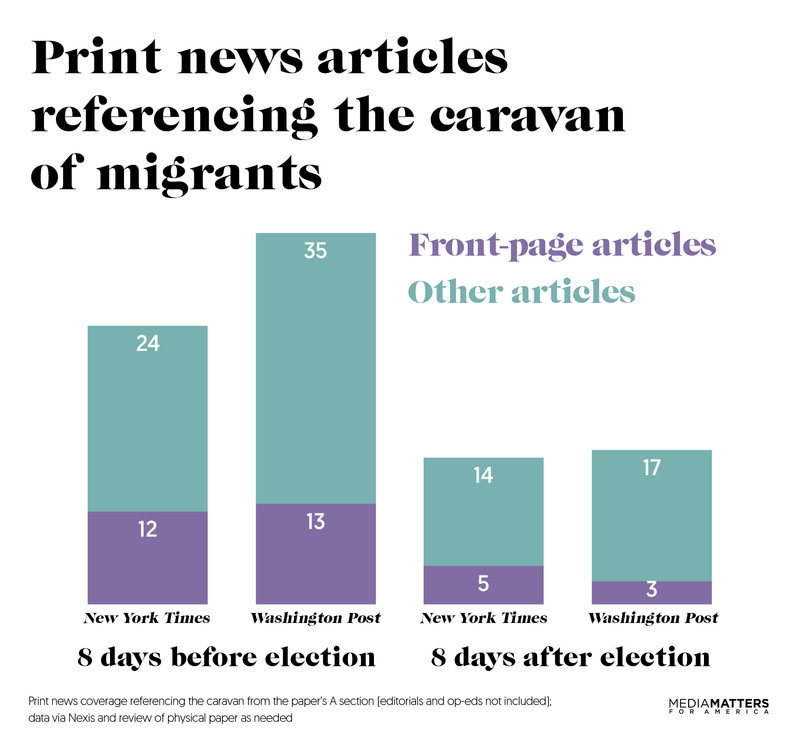 Before the election, the paper published five or more articles referencing the caravan on six different days. Since the election, it has done so once. 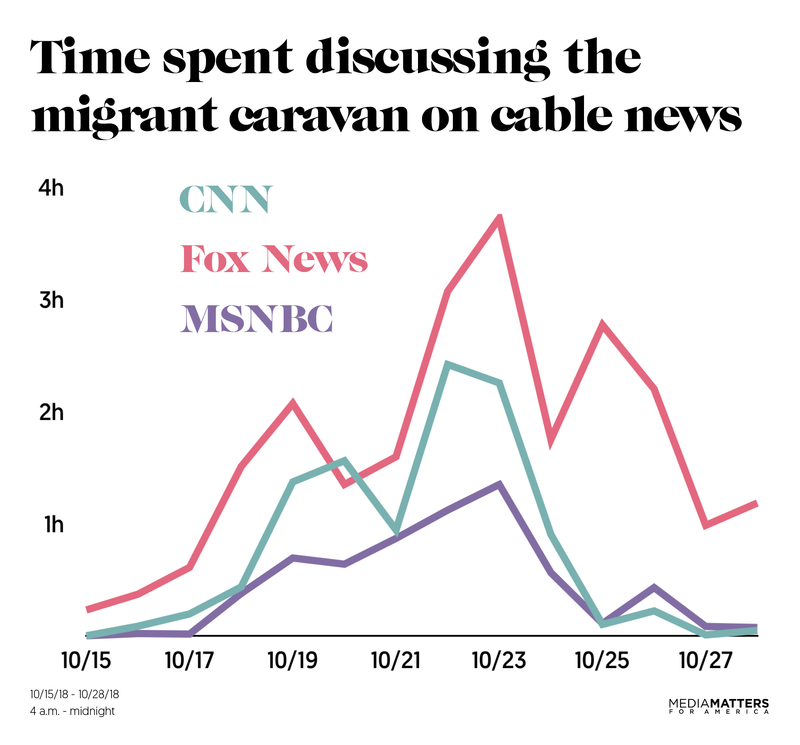 The massive print coverage of the caravan story leading up to the election echoed the story’s dominance on cable news. 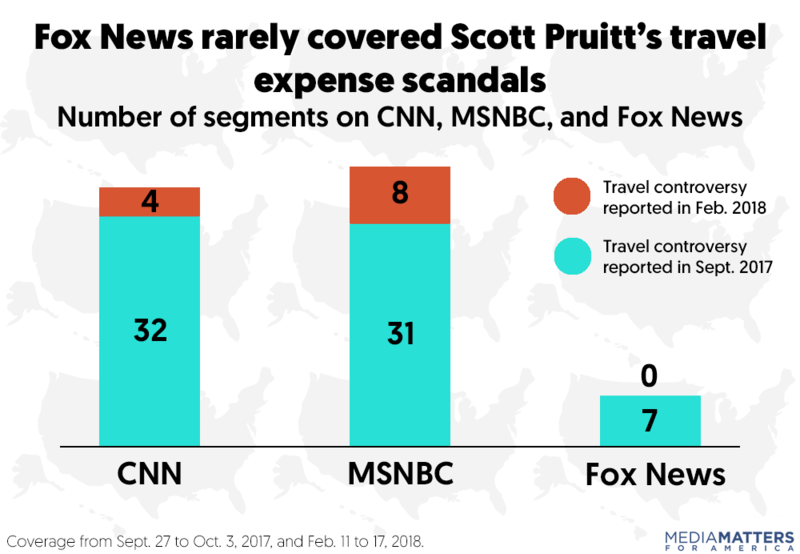 Fox led the way, providing more than 33 hours of coverage through Election Day, with the network’s hosts spurring and echoing the president with apocalyptic, conspiracy theory-minded rants about the coming “invasion.” But the day after the election featured no discussions whatsoever focused on the caravan, while the network spent four minutes and 57 seconds covering the story the day after that. After Trump took Fox's advice and tried to turn the caravan into an election issue, CNN and MSNBC also devoted hours and hours of programming to the story. 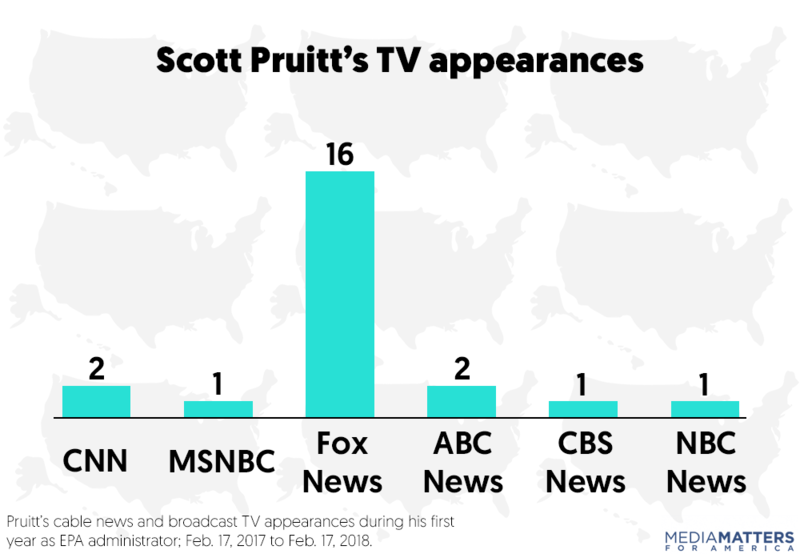 As with the papers, these cable networks produced far more critical coverage of the story, but they nonetheless focused their attention on the subject Trump wanted to discuss. And in the same manner as the Post and the Times, the volume of their reporting has dropped substantially since the election. As I wrote before the election, the facts about the caravan neither matched Trump’s crisis narrative nor justified the saturated coverage the story received. Since then, the “first wave” of the caravan has reached the U.S. border (most of the migrants are still 1,000 miles away), while the administration has imposed radical new asylum restrictions in response. 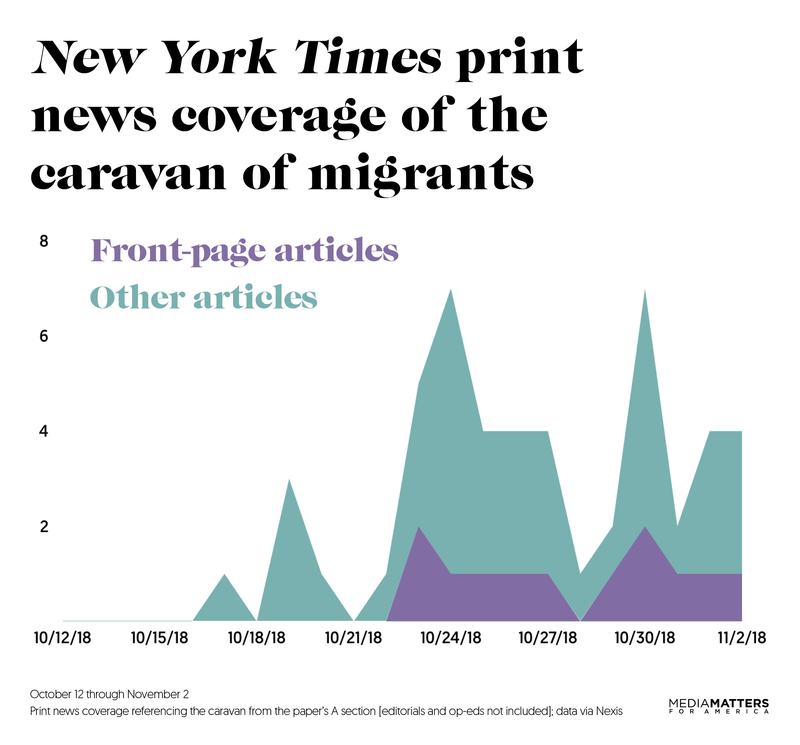 But while those factors suggest that the caravan has become increasingly newsworthy on its merits, the Post and Times have produced fewer articles mentioning it and put fewer on their front pages. These results strongly suggest that for these newspapers and cable networks, the newsworthiness of particular issues is strongly tethered to whether Trump is publicly commenting on them. Whatever he’s talking about quickly becomes the most important story in U.S. political journalism. And once he stops commenting on it, the story falls out of the headlines. Reporters might respond to this criticism by saying that the president’s comments are always newsworthy. 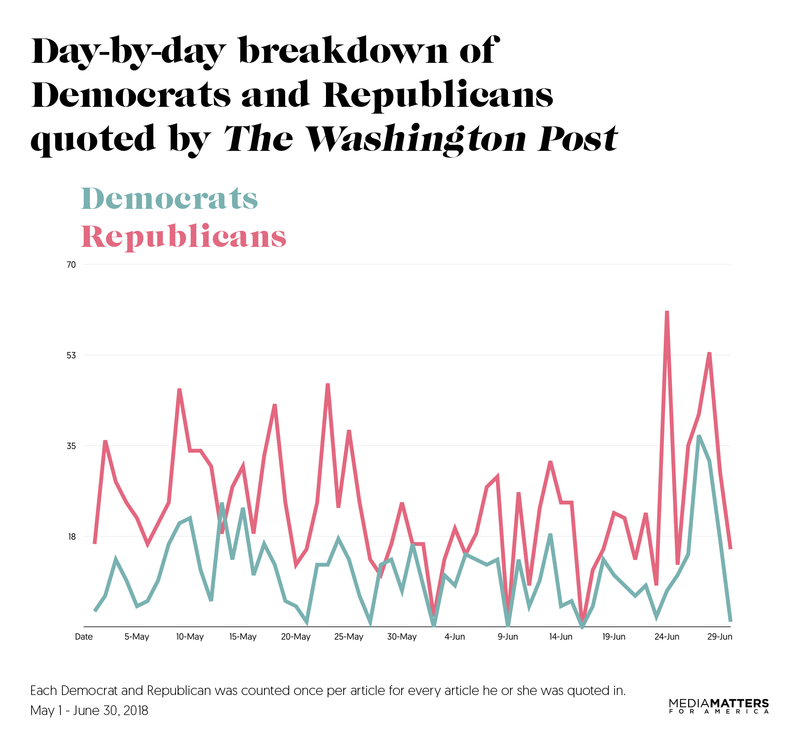 But that sentiment is not reflected in actual news coverage -- the closing days of the 2014 and 2016 election cycles were both dominated by Republican attacks on Democrats, not by President Barack Obama’s commentary. 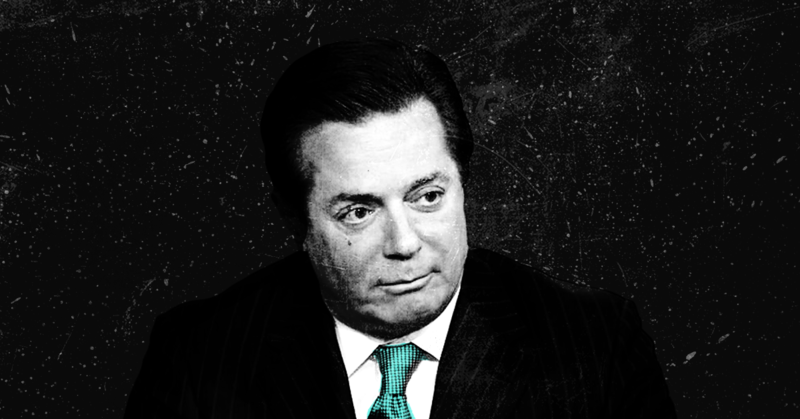 Moreover, under the current president, that argument cedes substantial power over the public debate to a notorious liar and conspiracy theorist. Journalists should carefully consider what that means. 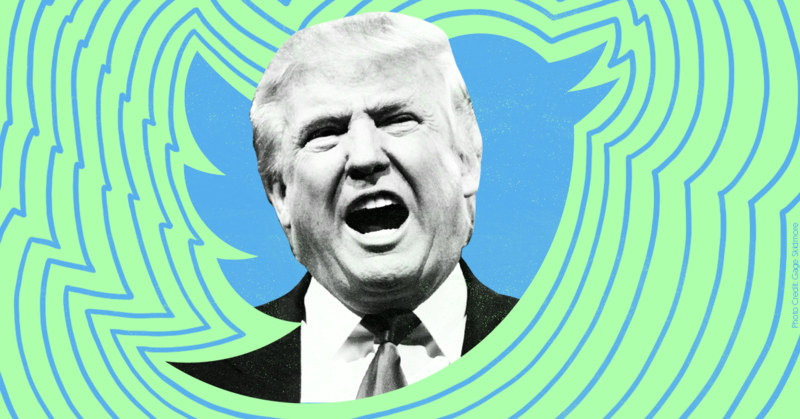 By allowing Trump to serve as their assignment editor, decision-makers at newspapers and cable news channels are ignoring critical issues in favor of covering what the president wants to talk about. This is an ongoing crisis in political journalism, and it won’t end unless journalists heed the lessons of the last few years and learn how to respond when conservative leaders try to manipulate them in bad faith in order to focus the public’s attention where they want it. That will require them to make independent calls on what deserves coverage and how much, rather than following the whims of Trump and his ilk. Media Matters searched the Nexis database for New York Times and Washington Post articles mentioning the caravan between October 12 and November 14. We included articles from only the print editions of each paper, and we limited the results to articles from the news (A) sections; articles from editorial, opinion, op-ed, business, sports, and other sections were excluded. For the November 7 edition of the Post, which was not available in the Nexis database as of publication, two Media Matters researchers independently reviewed a hard copy of the paper’s A section. Trump admin claims replacing Clean Power Plan will help minorities. That’s not true. The Trump administration has proposed a replacement for the Obama-era Clean Power Plan, and it's defending its proposal by citing a thoroughly debunked and discredited 2015 study from an industry-funded front group, the National Black Chamber of Commerce. The Clean Power Plan (CPP), finalized by the Environmental Protection Agency (EPA) under President Barack Obama in 2015, called for reducing carbon emissions from coal-fired power plants while increasing the use of renewable energy. The Trump administration intends to revoke that plan and replace it with the Affordable Clean Energy rule, would allow much more pollution from coal plants. According to Harry Alford, President of the National Black Chamber of Commerce, CPP would increase Black poverty by 23 percent and Hispanic poverty by 26 percent. It would result in cumulative job losses of 7 million for Blacks and nearly 12 million for Hispanics in 2035. But the NBCC report was thoroughly debunked after it was released in 2015. Two of those studies were the focus of a recent UCS webinar showing how such studies use bad assumptions and get used to sow confusion and spread disinformation about the CPP. One of those, done by IHS on behalf of the U.S. Chamber of Commerce, is the report most cited in this new work, even though it was one of those that came out before the draft CPP, and even though there was, as the Chamber itself admitted, “a big difference” between what they’d modeled and what EPA put forth (which the new study doesn’t acknowledge). The flaws in the study by Energy Ventures Analysis (EVA) for Peabody Energy (the largest U.S. coal company) are also clear. The Center for Climate and Energy Solutions has pointed out that, unlike other studies, EVA’s didn’t even show a business-as-usual case, meaning that any CPP results were floating in a vacuum, without reference to a base case of shifting energy costs and other economic factors. [The U.S. Chamber] study wrongly assumed the administration would set a benchmark of reducing carbon emissions by 42 percent before 2030. The regulations released June 2 actually put forward a 30 percent reduction within that timeframe. The chamber itself told PolitiFact its estimates are not based on the goals as announced. For that same reason, The Washington Post's fact-checking team gave Republican politicians who cited the Chamber of Commerce study in 2014 a "Four Pinocchio" rating, its lowest. Separate fact-checks cast doubt on another study that the NBCC report relied on, this one conducted by NERA Economic Consulting in 2014. The Union of Concerned Scientists wrote that the NERA study "falsely inflates the cost of the Environmental Protection Agency’s Clean Power Plan by denying energy efficiency’s proven ability to save consumers money," and went on to explain that the study used "a 2012 study that has been repeatedly discredited" to justify its inflated cost estimates. 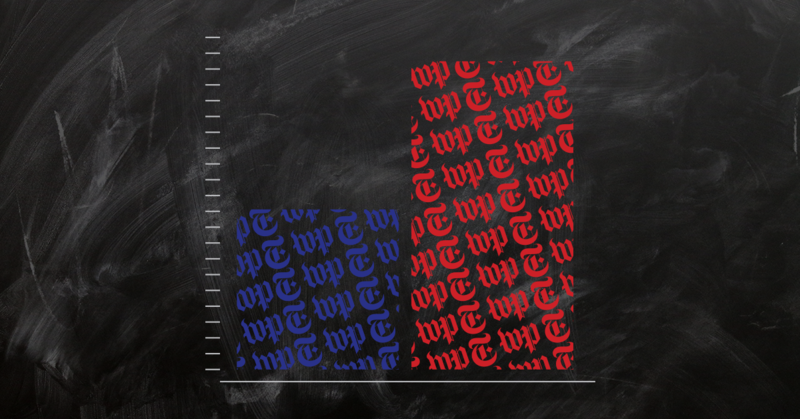 The Washington Post's fact-checking team also raised serious questions about the NERA study. The NERA study was funded by industries that had much to gain from stymieing the Clean Power Plan, including fossil fuel interests. Among the commissioning groups were the American Coalition for Clean Coal Energy, American Fuel & Petrochemical Manufacturers, and the National Mining Association. Alford, president and CEO of the National Black Chamber of Commerce, became a central figure in a disinformation campaign backed by fossil-fuel interests because he was willing to assert that the Obama EPA’s Clean Power Plan would harm communities of color. 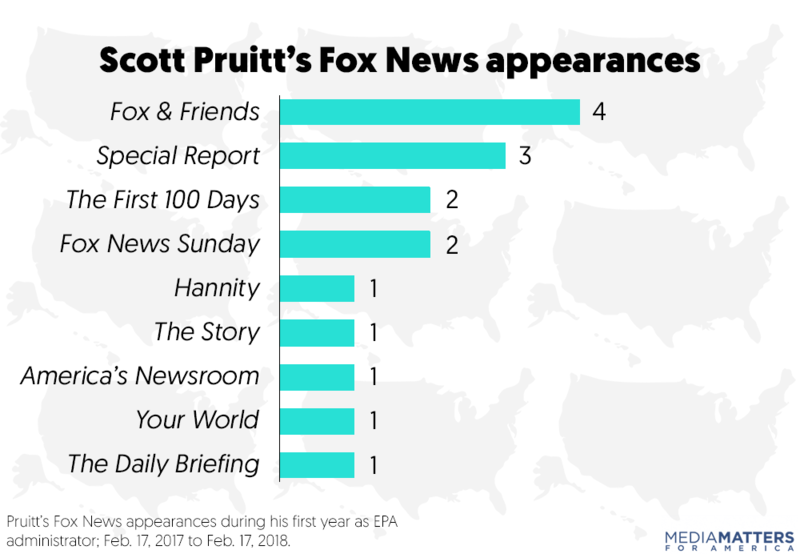 He placed anti-Clean Power Plan op-eds in at least seven newspapers and saw right-wing outlets echo and amplify his discredited assertions. In fact, the EPA under Obama took steps to ensure that the Clean Power Plan addressed many of the environmental and economic concerns of minority and low-income communities, after pressure was applied by civil rights leaders, environmental justice groups, and environmental activists. The report alleges that the Environmental Protection Agency’s Clean Power Plan will harm African American and Hispanic families, when in fact findings from numerous independent organizations show the plan will actually benefit communities. In reality, the Clean Power Plan will prevent asthma and other pollution-related illnesses, create hundreds of thousands of new jobs, and save families money on their utility bills. Low income and minority Americans, who are most often the hardest hit when it comes to the effects of climate change, will benefit substantially. Recently the Natural Resources Defense Council (NRDC) produced a report reaffirming and further outlining these benefits. The report also refutes many of the myths asserted by the NBCC, known to [be] funded by special interests groups seeking to preserve the bottom line for dirty energy companies. The Trump Administration continues to put the health of the Latino community and all Americans at risk by gutting the Clean Power Plan, the first and only federal limit on carbon pollution from power plants — a major source of the pollution that exacerbates climate change — which protects public health and promotes climate change solutions. The Latino community is hit first and worst by climate change and we suffer disproportionate public health effects with 40% of Latinos living within 30 miles of a power plant. The stakes are too high, with Latinx children being 40% more likely to die from asthma than non-Latino white children. Today, as we continue to witness these severe weather patterns and devastating impacts of carbon pollution on public health, the Trump Administration is moving to dismantle the Clean Power Plan, endangering the health of our communities and undermine the transition to cleaner and safer renewable energy sources. GreenLatinos rejects the efforts by the Trump Administration and Acting Administrator Wheeler as they disregard the overwhelming support for increasing efforts to protect our air quality. Other environmental justice advocates also spoke out against the Trump EPA's Affordable Clean Energy rule. 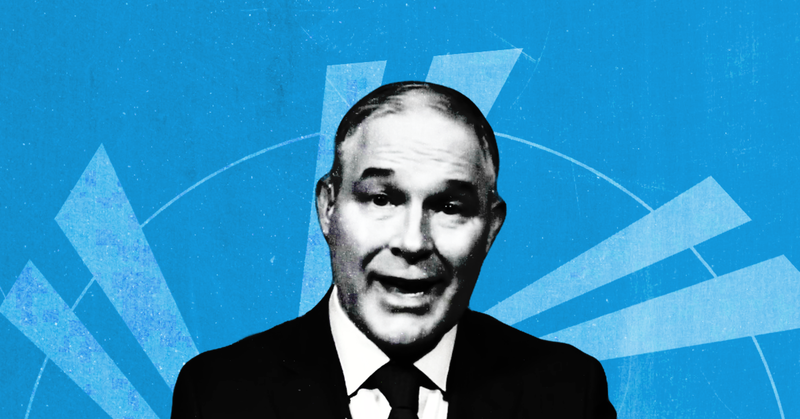 “They’re really putting people’s lives in danger,” Mustafa Santiago Ali, a senior vice president at the Hip Hop Caucus and former EPA advisor on environmental justice, told Earther. 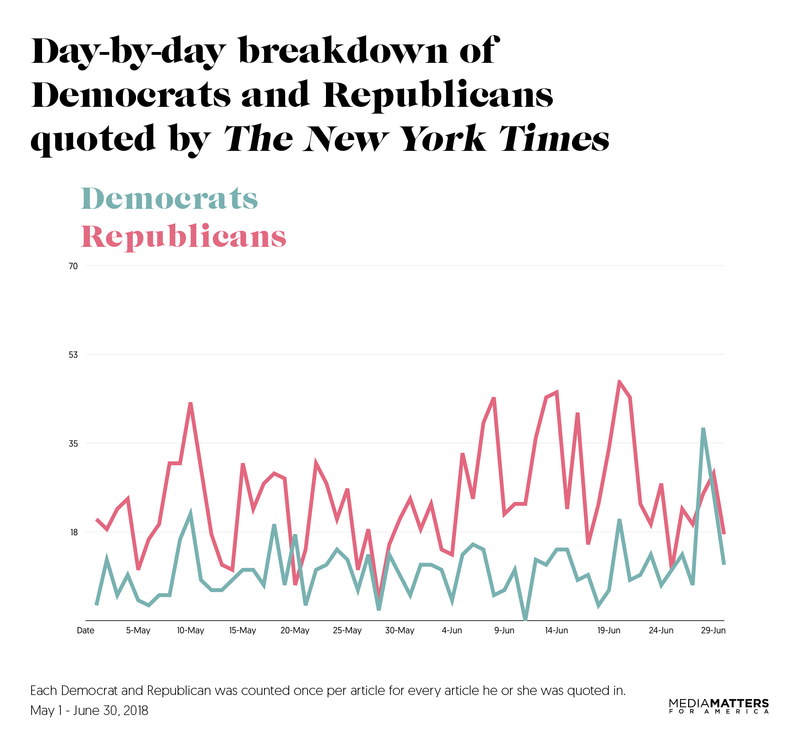 Throughout May and June, two of the nation’s leading newspapers, The New York Times and The Washington Post, quoted Republicans at more than twice the rate of Democrats in their political news coverage. 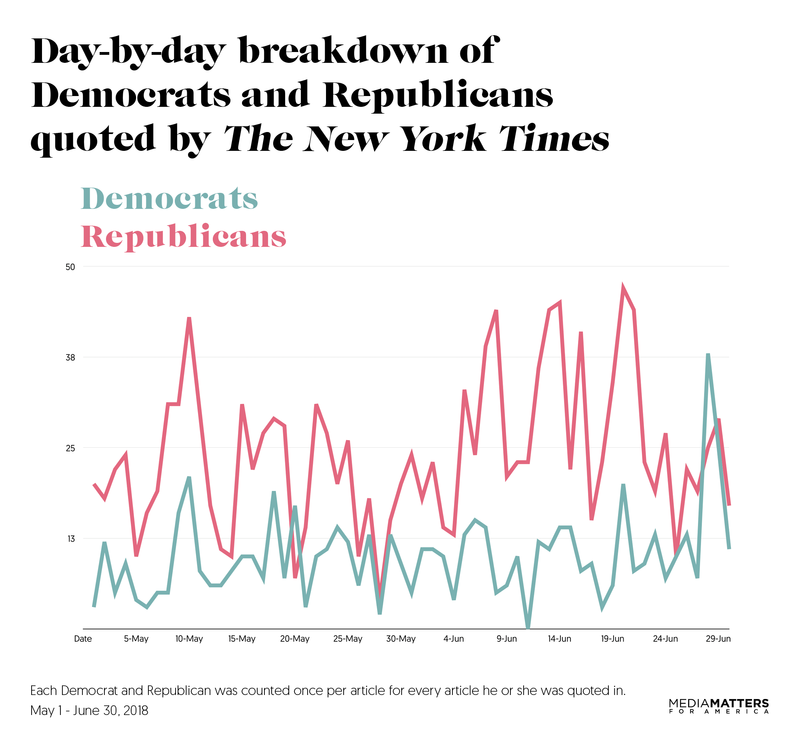 In an analysis of the papers’ news and political coverage during May and June, Media Matters found that the Times quoted 1,466 Republicans and 611 Democrats, a ratio of approximately 2.4 Republicans for every Democrat. 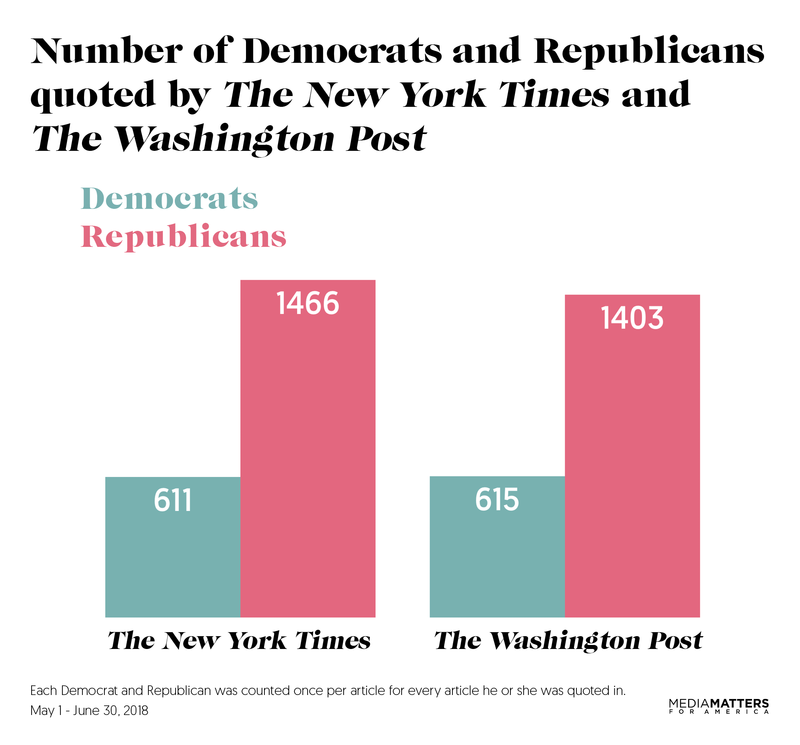 The Post quoted 1,403 Republicans and 615 Democrats, for a ratio of approximately 2.3 Republicans for every Democrat. Methodology: Media Matters searched the Nexis newspaper database for articles in the print editions of The New York Times’ and The Washington Post's news and politics sections between May 1 and June 30, 2018, that mentioned any elected official, administration official, or other government official in the headline or lead paragraph. In approximately 2,200 articles from the two newspapers during May and June that fit that criteria, we coded for political strategists; candidates; elected officials; administration officials; and close political advisers, family members, or personal lawyers of President Donald Trump who were quoted. Additionally, we coded anyone quoted whom the paper identified as partisan. We coded each individual once per article as either Democratic or Republican. Members of New York’s Working Families Party were coded as Democratic. Rob Savillo and Shelby Jamerson contributed research to this report. A far-right party and an anti-establishment party that controls a fake news network won in major upsets in Italy’s general election on March 4 and are now vying to form a majority government. But major U.S. newspapers, some of which had previously covered the threat of fake news in Italy, entirely ignored the likely role fake news played in the election’s outcome. Researchers in Italy noted the increasingly alarming role of fake news after Italy’s 2013 election. But the country began paying closer attention to the problem after BuzzFeed and Italian newspaper La Stampa exposed anti-establishment party 5-Star Movement’s foundational role in a network of blogs and social media accounts spreading fake news, conspiracy theories, and Russian propaganda. In November 2017, a year after its original report, BuzzFeed reported on another network spreading hyperpartisan misinformation on Facebook, this one run by “an entrepreneur in Rome with links to a secretive Italian Catholic association.” That same month, former Prime Minister Matteo Renzi asked social media companies, particularly Facebook, to “help us have a clean electoral campaign. The quality of the democracy in Italy today depends on a response to these issues.” In January 2018, the U.S. Senate Committee on Foreign Relations summarized the threat of fake news and Russian-backed misinformation in Italy (page 137 of the report) and called on the U.S. government to cooperate with Italy on addressing the issue. Despite warnings from the U.S. and Italian governments, investigative reporting from media outlets and, in the case of The New York Times and The Washington Post, major newspapers’ own reporting on the role of fake news in Italian elections, these papers failed to acknowledge the possible links between far-right misinformation campaigns and the March 4 election outcome that was aligned with their message. According to a Media Matters analysis of coverage on Italy’s election day and the following two days, major U.S. newspapers including the Post, the Times, The Wall Street Journal, and USA Today engaged in zero significant discussions of the threat of fake news in the Italian election. Two passing mentions of “conspiracy theories” in the Times' op-ed section were the closest the outlet came to discussing the role of fake news. 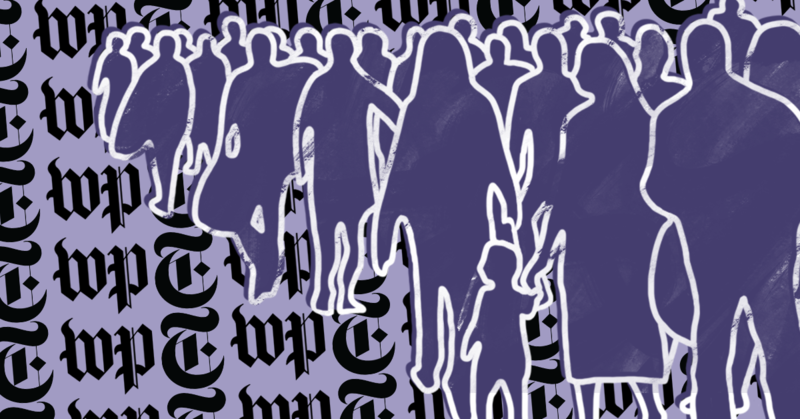 The failure of these major outlets to connect widely reported, far-right, election-oriented fake news to far-right electoral outcomes raises serious concerns over their ability to inform readers about the threat of fake news for democracies around the world.